Face it, we live in a digital world. A world full of media-rich materials. It goes to reason that when we create materials to share, that we too want to provide that media-rich experience for those people using our materials. There comes the rub, not all or even many of us have the skill or the know-how to create that media-rich environment. We are reduced to combing the Internet for just the right graphic or chart to include in our work. But it begs the question; “What is right to use and what is fair?” There is much talk about copyright and the myriad gray (and not so gray) areas involved in its use within academia. When using images from the Internet, look for material marked as either Public Domain or Creative Commons. Additionally, did you know that there is an advanced feature in Google image search where you can specify or filter which usage rights to return results for – very cool. At any rate, it is important to respect the intellectual property of the people who create the images; in many cases, it is a source of income for them. 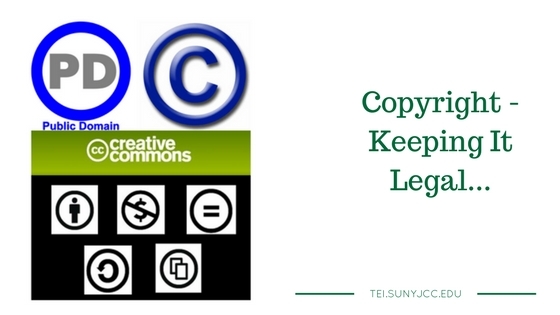 Check out the article by Richard Byrne for Good Places to Find Creative Commons & Public Domain Images and Copyright & Fair Use in Teaching by Scott Schopieray to learn more about the issue.